Events paying homage to late Anton Balasingham were held simultaneously at Kilinochchi, Mullaitivu and other areas in Vanni as his funeral was being held at Alexandra Palace in north London Wednesday. "Our nation has lost the wise guide who was with our National leader in many of his enterprises," Mr. Puthuvai Ratnathurai said. 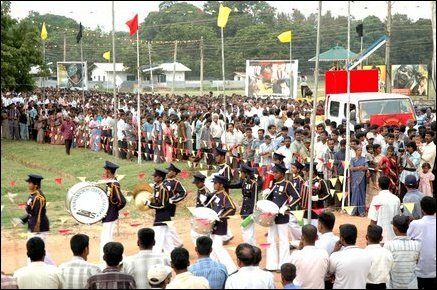 The procession, with the vehicle bearing the image of late Anton Balasingham, beginning from the portals of Kilinochchi Murugan Temple around 5:00 p.m and accompanied by percussion band, reached Kilinochchi Karachchi Predesha Sabai where a stage was specially constructed for the event. Thousands of people from all walks of life participated in the procession and the event. Head of the Justice and Administration division of Tamil Eelam Mr. Para, lit the principal flame while LTTE's Northern Front Forces' Commander Col. Theepan, hoisted the Tamil Eelam flag at half mast. Col. Theepan garlanded the photograph of late Anton Balasingham and lit the lamp in front of it. Kalaivanan, Liberation Tigers of Tamil Eelam (LTTE) Kilinochchi District Head of Political Section, addressed the mourners. Rev. Joseph and Teacher Pahirathi made the tribute speeches in memory of late Anton Balasingham. Homage was paid to the 'Voice of the Nation' Anton Balasingham also at Puthukudiyiruppu, Mallavi and Madu.